Handcrafted antler tables, Alaska Yukon Moose. Looking for a centerpiece for your great room or a small rustic table for your den? 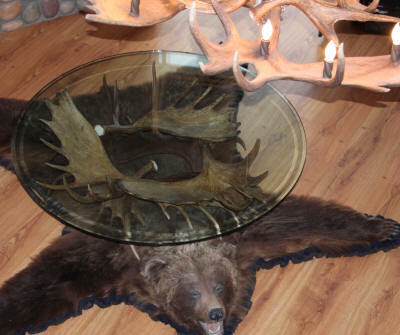 Alaska Antler Works specializes in moose antler tables. 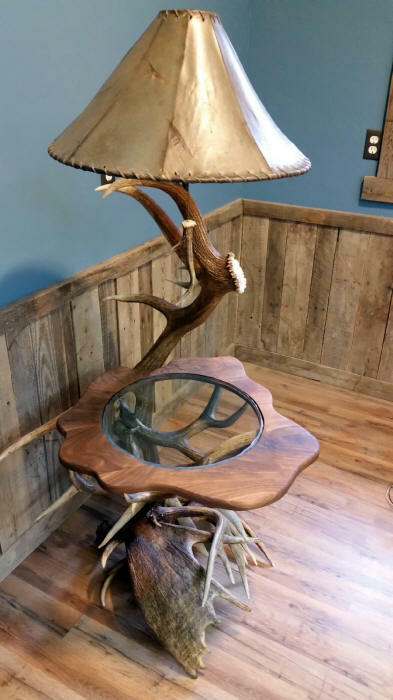 Our other antler furniture includes dining tables, coffee tables, end tables, and desks made from deer, moose, and elk antler. We have some standard moose antler coffee tables with either pencil polished glass, frosted and etched glass, or a layered edge glass. Our tables can be built to fit a custom space in your home. Each table is made from naturally shed antlers; because each antler is different no two tables will be the same. This extra large coffee table is truly impressive with four to five large moose antlers, a centerpiece for your home worthy of attention. The table height is approximately 19". 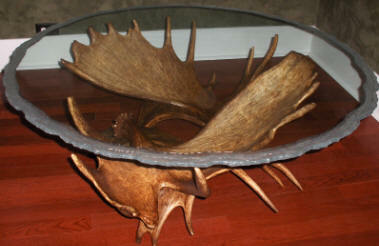 This extra large round coffee table is made with an impressive six large moose antlers. The table height is approximately 19". A real eye catcher, this moose antler table is made from four or five moose antlers with a table height of approximately 19". Custom moose antler and juniper wood bedside table. 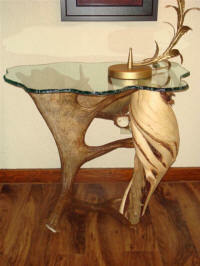 Our three moose antler end table has two upright moose antlers and one resting just under the glass. 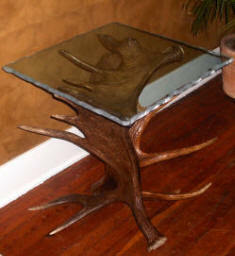 Our deer antler end table, perfect as an end table or night stand. 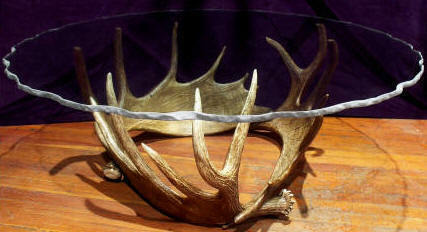 A well displayed mix of tines and paddles is the highlight of our medium moose antler coffee table. 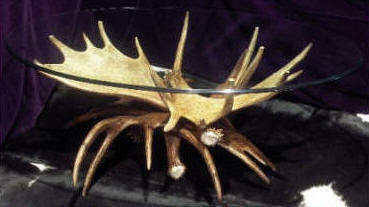 Made from four moose antlers with a table height of approximately 19". Three perfectly balanced moose antlers displayed on their side in this moose antler table will certainly make a statement in your living room or den. The table height is approximately 19". 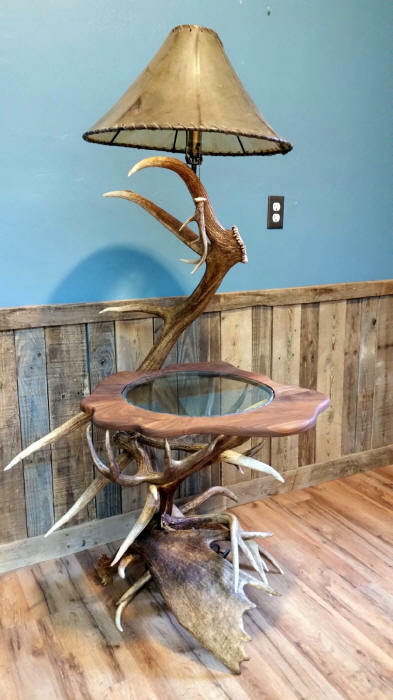 A smaller antler dining table made from elk, whitetail, and mule deer antlers. Our antler dining table of whitetail deer, elk, moose, and mule deer antlers. Our antler desk is made of whitetail, elk, and moose antlers. 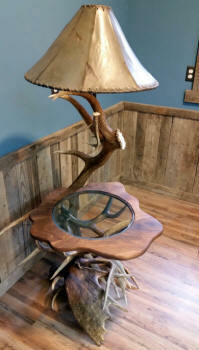 Custom antler sofa table made from five elk antlers and a moose paddle. The table top is made from maple burl with live edge. Iron accents bring it all together in this rustic and elegant table. A functional piece of lighting for your home. 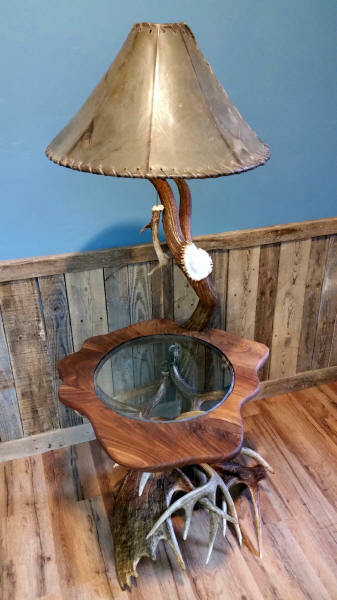 Our elk antler floor lamp holds a custom cut piece of walnut wood with inlay glass top. 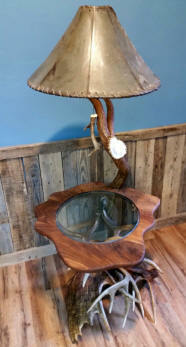 Base of lamp is built from moose and deer antler.